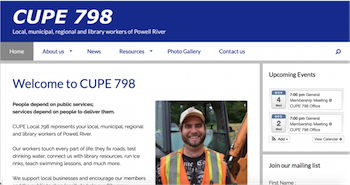 CUPE has moved to a new system for hosting web sites for our local unions. It’s built on top of the popular WordPress software, but gives you a pre-built basic site with CUPE logos and images, as well as many pages and menus already set up for you. It can integrate with either the CUPE Facebook and Twitter accounts, or if your local has their own, it can easily be connected to them instead. Nothing extra. The dues you pay to CUPE National cover the cost. Fill in the website hosting application form. We also need to know that you’ve got approval to create a site for your local - an email from your local president to comm@cupe.ca will do. Once we’ve created your site, you can start organizing and adding to it – if you run in to problems, email us at comm@cupe.ca. You do. Local autonomy is an important part of how CUPE has operated since it was founded. You decide what goes on it and you decide how it looks. How do I change how it looks? CUPE gives you a choice of four different site styles. You can choose another later, or if you know how to build web stylesheets you can customize them extensively. We’ll be adding more ways to change how your site looks as we go forward. Please enter the name of the person on your local's executive who will send us an email to webmaster@cupe.ca authorizing the creation of your local's site. Please enter that person's position on your executive. Please choose which of the sample sites you would like to use as a base for your local web site. Is there anything else we should know about your local, or your web site?